The Sauna is a place to relax with friends and family, and a place for physical and mental relaxation as well. In Finnish tradition, Saunas are not luxury treatments, but seen as a necessity for health and wellness. Before the rise of public Healthcare and Nursery, almost all Finnish mothers gave birth in saunas. Traditionally Saturday is the custom day for sitting in the Sauna. The number of sauna cycles- going into the sauna and cooling down out of - and the duration of time in and out of, can vary from person to person based on preferences and state of health. 2 cycles is the minimum to achieve balance for the central nervous system. The Sauna is a sacred space. Conversation is relaxed, it is rude to swear and controversial topics are avoided. Taking a sauna starts with washing one self up. Enter the dry, hot rock heated, Sauna. When the heat becomes uncomfortable its time to step out and cool down. Custom is to be wrapped in a towel and to have a drink and a snack. Step back into the sauna and repeat. 30 minutes- 2 hours can be expected. During a Sauna session heart rate increases 50-75%, similar to the increase created by a physical workout. A luxurious sauna spa session can help loosen fat, decrease appearance of cellulite, relieve joint pain and fatigue. Time tested aid for chest congestion, bronchitis and helping in the draining of the sinuses. Supports treatments for chronic fatigue, Fibromyalgia and insomnia. By applying heat to the body, blood vessels widen and open, improving blood circulation, causing sweating and detoxification for the body. Pollution in our environment leaves residue of synthetic chemicals and metals in our bodies that are fat- soluble, staying in the body where it has access to all organs and blood-brain and placental barriers. 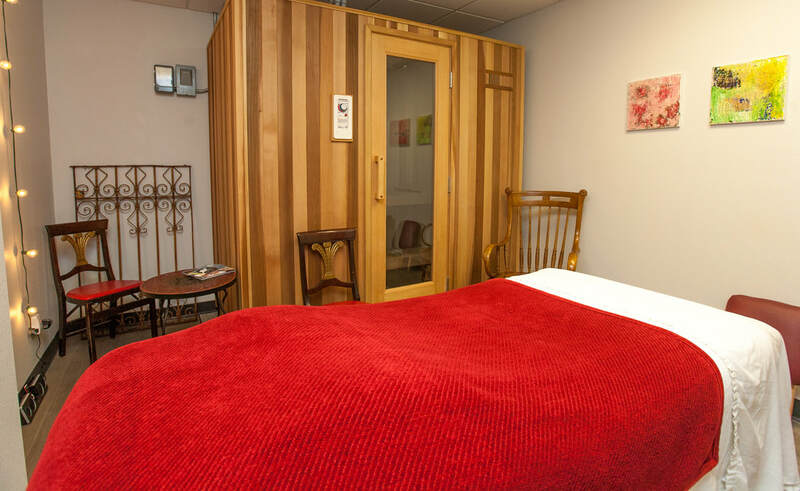 The Sauna Spa brings together our talented Collective massage team into one space to offer spa services in a peaceful setting.